This brand new holiday home is being built just outside St. Margarethen and will be finished in the autumn of 2017. All pictures shown are for illustrative purposes only. The house consists of an area where the owner lives, plus two separate 6-person apartments. Your apartment has its own entrance and a lovely south-west facing terrace. You're in a very quiet setting here, just outside St. Margarethen, only a few minutes' walk away from the Aineck-Katschberg ski piste. The spacious living room and the large dining table provide plenty of space for 6 guests. There are 2 bedrooms, each furnished with a double bed, and there's a double sofa bed in the living room. An absolute must in the perfect location for winter sports. 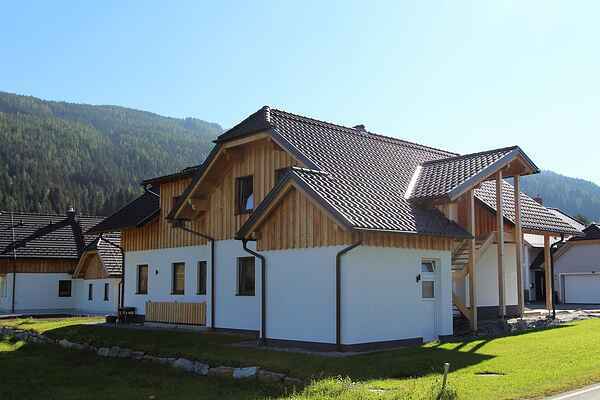 In summer the surroundings also have more than enough to offer, such as as a beautiful golf course, hiking and mountain biking from the chalet and near the many beautiful lakes in Carinthia. Note: including the Lungaucard. This is a discount card with which you have free access to, among other things, the mountain railways and much more! The Lungaucard is valid between 1 June and 31 October and requires € 2.30 pppn, children up to 6 years are free.